Tate Tobin prepares to connect with the ball in Highland’s Thursday contest at home against Fredericktown. Tobin had two hits, including a double, in the game, but the Scots fell by a 4-3 score. 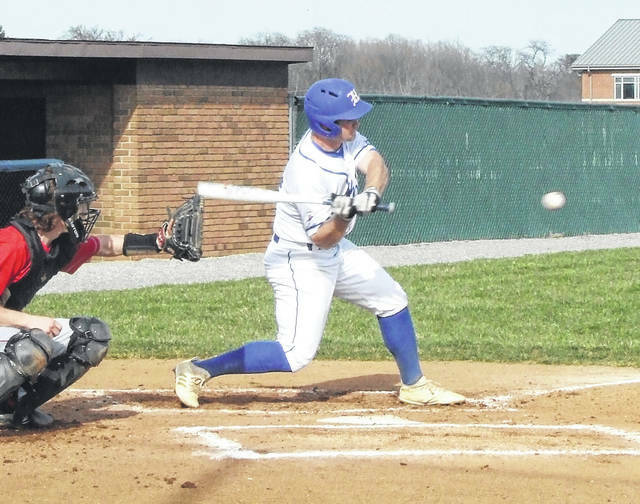 A four-run sixth inning gave Fredericktown the lead over the Highland baseball team on Thursday and a final-inning rally by the Scots fell just short in a 4-3 home loss for the locals. “We thought we had a good defensive plan, but they got a couple guys on and home and we went from winning to losing real fast,” said Highland coach Don Kline. For the first five innings, the two teams were locked in a pitching duel. Clemson commit Mack Anglin was dominating in his five innings of work, striking out 11, while giving up no hits. The Scot senior only walked one batter and hit two others, but none of those three base-runners was able to advance past second base. However, Fredericktown’s Nick Cunningham also was pitching a good game during that time. While he gave up three singles over the first two innings, no one was able to advance past second for Highland during those frames. Highland would take a lead in the third frame. Tate Tobin led off the inning with his second hit, as he mashed a double. With one out, a single by Clay Matthews moved Tobin to third base. The two runners then executed a double steal to get Tobin across the plate. That 1-0 score held up through the fourth and fifth innings. Anglin struck out five during that time, while Cunningham only surrendered a single to Rider Minnick. Highland went to the bullpen in the sixth inning and Fredericktown was able to take advantage of the pitching change. Owen Mott came into the contest and gave up back-to-back singles to Nick Cunningham and Caleb Sheriff to put runners on the corners. A passed ball moved Sheriff to second base and then a single by Clem Cunningham brought both runners home. A single by Ty Hatfield put runners on the corners and ended Mott’s day. Jack Weaver quickly walked the bases loaded, but then recorded three straight outs. Unfortunately for the Scots, both of Weaver’s inherited runners would cross home during that stretch, as Zach Vogelsang hit a sacrifice fly and Jake Partington added an RBI on a groundout. In the sixth inning, Anglin reached second base on an error by the Freddie third baseman, but was stranded after Nick Cunningham recorded three straight strikeouts. After a perfect seventh by Weaver, Highland had one final chance to come back in the game. Liam Garrett opened the inning with a single. Nick Cunningham then recorded two consecutive outs, but Minnick drew a walk and Matthews had a single to load the bases for Anglin. He smacked a double to drive in two runs and make it a one-run game, but Fredericktown was able to survive when their pitcher was able to record one more strikeout to finish his day with nine. Both Tobin and Matthews had two hits for Highland. Tobin and Anglin both had a double in the game. Kline noted that his team won’t have long to think about this loss, as they’ll be taking on the Freddies again Friday for their second game against them.